The working principle of the system is based on the continuous flow method. First the mercury contained in the sample is transformed into the elemental state by addition of a reducing agent to the sample flow. In a cross-flow reactor the mercury is stripped with a gas stream and carried into the optical cell which is made entirely of fused silica. There the quantitative determination of mercury is obtained by measuring UV absorption at a wavelength of 253,7 nm at room temperature. This analytical technique is commonly known as cold vapor atomic absorption spectrometry (CVAAS), a method that has proved itself as extremely sensitive and selective over many years. In contrast to a typical multi-element AAS the AULA is specially designed for mercury determination. This allows top performance in analytical applications. The use of a highly stable low-pressure electrodeless mercury discharge lamp (EDL) in connection with the latest UV detector techniques result in excellent baseline stability and low detection limits. With an optional barcode stick sample data can be entered comfortably. A sample table is created automatically and can be viewed in the table screen. Sample dilution factors as well as sample weight and final fill up volume for digestion of solid samples can be entered in the table. The result of the measurement is calculated automatically from the chosen calibration function and displayed in µg/l or µg/kg. The QCS function assures a high level of reliability of the analytical results. The results of the analyses together with the data necessary for quality assurance (date, time, user ID, sample number, calibration data, instrument parameters) are stored in a file. They are available at any time for display and printout. Worksheet templates can be created and stored to minimize setup time for routine work. Measurements of up to 20 calibration standards and up to 53 samples and check standards are carried out fully automatically. Standards and samples are filled into 10 ml glass vials and positioned on the auto-sampler turntable. Reagent solution (for example tin-(II)-chloride) and rinse solution (reagent water) are filled in the corresponding glass tanks. Then the stripping gas flow is adjusted and measurement is started by a keystroke. The measurement cycle can be interrupted at any time by the operator for selecting any sample to be measured next. Readings and instrument status are displayed in real-time on the screen. The stability of the baseline is checked prior to each measurement and the zero point is adjusted automatically. The typical zero drift during a measurement is below 0.0001 absorbance units. Mercury vapor has a general tendency to absorb on surfaces causing a memory effect. This undesirable property has been minimized by using selected materials (fluoropolymer, borosilicate glass, Tygon LFL) for sample and reagent conducting components and by heating the optical bench. 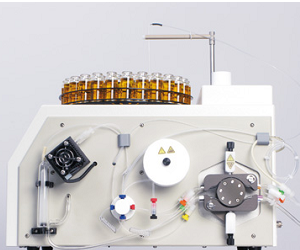 In addition, the auto-sampler probe and the sample tubing are rinsed after each sample. This also allows a high sample throughput. Even samples with concentrations in the upper measuring range do not produce a carry over to the following sample. Unlike traditional mercury analyzers, which use drying tubes for removing water vapor from the sample gas, the AULA 254 uses a maintenance-free thermoelectric dehumidifier. The dew point of the gas is decreased below ambient temperature thus the water condenses on the wall of a small glass tube and flows back into the reactor. The stability of the carrier gas flow has a direct effect to the reproducibility of measurements. For this reason the AULA-254 Gold system uses a highly precise (1.5 % accuracy) electronic mass flow controller (MFC). 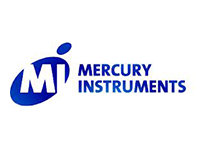 The instrument automatically interrupts the measurement if samples with mercury concentrations exceeding the measuring range are detected. In this case the system is immediately cleaned. 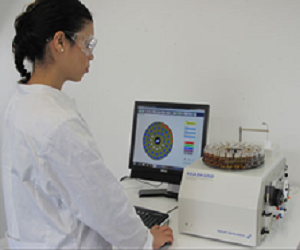 The AULA 254 can be equipped with an optional sample preparation system for aqueous samples. The digestion procedure derives from standard methods commonly used in the laboratory. The sample is automatically drawn from the auto-sampler vial and is continuously mixed with a strong oxidizing reagent (e.g. potassium permanganate, bromide-bromate). Subsequently the sample/oxidant mixture is heated to approx. 98 °C in a heated coil. After the oxidation step hydroxylamine hydrochloride and tin-(II)-chloride are added for reduction of mercury into the elemental state. Typical applications of the AULA-ASD system include analysis of aqueous samples that have to be digested oxidatively before reduction: surface water, groundwater, effluent, process water. The integrated GoldTrap preconcentration module drastically enhances the detection limit to values lower than 1 ng/l. Using ultrapure reagents and following the guidelines for mercury analysis at ultratrace levels (e.g. given in EPA method 245.7 or method 1631) a measuring range from 1 ppt to 5000 ppt can be achieved. This complies with the performance data given in EPA method 245.7 or 1631. An outstanding property of the newly developed GoldTrap is its minimum thermal inertia. This has become possible by use of a wafer thin ceramic substrate. As a consequence heating and cooling rates become very fast. Analysis durations are comparable to the direct method. The AULA-254 Gold allows the user to select if analyses shall be carried out with or without a preconcentration step. This makes the instrument versatile for any application.